Welcome to Harlequin Fun Casino! We are a professional, reliable fun casino table hire company based in Hampshire specialising in Wedding Casino’s, Corporate Events, Party Casino’s and Christmas Party Casino’s offering genuine, full size immaculate casino tables to hire for any special occasion. Whether you’re looking to hire a Blackjack table, hire a Roulette table or even a few of both, our team of dedicated staff and professional croupiers are here to make sure your event is a huge success! Harlequin exclusively use luxurious, authentic, full size fun casino tables complete with authentic chips, cards and accessories. We pride ourselves on having premium quality casino tables and friendly, fun-loving professional croupiers who always ensure that you and your guests have a fantastic casino experience. Based in Basingstoke, Hampshire Harlequin Fun Casino host parties in Hampshire, Berkshire, Surrey, London, Oxfordshire, Wiltshire, Sussex, Kent, Essex and beyond. 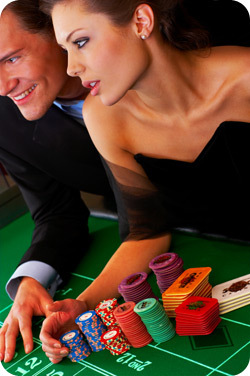 We’ll ensure the entire casino hire process is both simple and enjoyable from start to finish. So check out our great Website and I do hope find it useful. Please do get in touch with any questions you may have and I would be more than happy to help. Once again Thank You for visiting us and look forward to speaking with you soon about How we can provide you with some Casino Tables at your next Event.